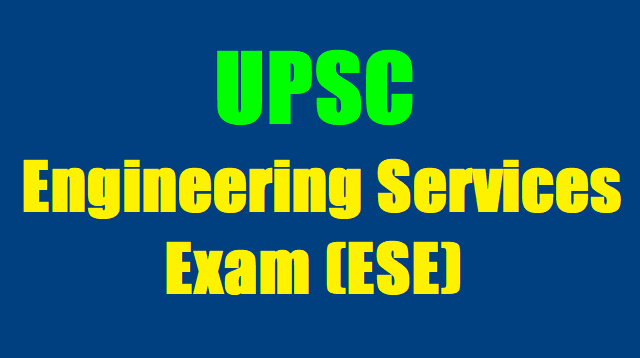 UPSC (ESE) Engineering Services Exam 2018, IES Prelims Admit Cards/ UPSC Engineering Services Exam 2018, IES Prelims On 6 January, IES Exam Details At Upsc.gov.in. Union Public Service Commission has released official notification for the Engineering Services Exam (ESE) 2018. Popularly known as IES 2018, the exam gets huge attention from engineering graduates, every year. Recruitment is made to civil, mechanical, electrical and electronics & telecommunications engineering. Though the Commission is likely to change the number of vacancies, the approximate number is 581, as of now. The preliminary examination will be held at 42 cities across the country on 6 January 2018. Official notification can be found at the upsc.gov.in. UPSC Engineering Services (Prelims) Examination 2019: Union Public Service Commission(UPSC) has released the e-admit card for Engineering Services (Prelims) Examination 2019on December 12. Candidates who will be appearing in the examination can check the official site and download the admit card through UPSC at upsc.gov.in. The admit card will be available on the official site from December 12, 2018 to January 06, 2019. The UPSC Engineering Services (Prelims) Examination 2019 will be conducted on January 06, 2019. The notification was released on September 26, 2018 and the last date to apply was till October 22, 2018. The UPSC Engineering Services (Prelims) Examination 2019 will fill up 581 posts of Engineers in various Administrative services across the country. Step 1: Candidates can download the admit card by following these simple steps. Step 2: Visit the official site of UPSC at upsc.gov.in. Step 3: Click on UPSC Engineering Services (Prelims) Examination 2019 Admit Card that is scrolling on the right hand side of the screen. Step 4: Login by registration ID or by roll number. Step 5: Download the admit card and keep a print out copy for further reference. Union Public Service Commission (UPSC), the exam conducting body for Engineering Services Exam (ESE) has released admit card for the prelims. Admit card has been released at the official website of UPSC at upsc.gov.in. For downloading, the same, candidates shall have to login at the portal upsconline.nic.in. UPSC will conduct the ESE Prelims for selecting candidates against vacancies. The exam will be conducted in 42 cities nationwide. UPSC conducts ESE every year and recruitment is made to civil, mechanical, electrical and electronics & telecommunications engineering. Union Public Service Commission invited applications for Engineering Services Examination-2018. Category IV- Electronics & Telecommunication Engineering. Age Limit: 21 to 30 years on the 01st August, 2019.